You gotta have two things to win. You gotta have brains and you gotta have balls. Now, you got too much of one and not enough of the other. - Fast Eddie (The Color Of Money). With London wanting to extend the lead they'd had built up in the Regional Competition to ensure they travelled to Yarmouth next year, and with Kent seeming to be on the ascendency and with nothing to lose this turned out to be a highly competitive match throughout. Man of the Match went to World Junior Finalist, Frank Costello with a fine 4/4 frames. He was ably assisted by Eno Idiong, Josh Patel, Adam Coppen and Adam Everitt who all managed 3/4 frames. While it's a little early to celebrate I can't see the lads slipping up now. The B Team returned to winning ways with a 24-20 win over Kent B. At 8-3 and 15-7, London looked likely to record the sort of scoreline that at least would have kept us in touch with Surrey at the top of the table, but a poor 8-3 reversal in the third set and only a narrow 6-5 victory in the fourth put paid to that. With Surrey winning 29-15 at Berkshire, they now certain to retain the regional title. Predictably, London team had a stronger look to it than the side who lost away to Sussex last month. Graham Thompson, Bri Chudasama and John Runghen were all in good form with 3 out of 4 each, but man of the match was Alex Lawrence, returning to the side with an impressive 4 out of the 4 and dish of the day in his final frame to secure the win for London. Not a great day at the office for the girls by any stretch of the imagination. We seemed to get more chances than we�d usually expect against the regional leaders, however we seemed unable to capitalise on them. We were comprehensively beaten by the National Champions but I believe the players we now have in the squad are not short on ability and we are more than capable of moving up a level to give the likes of Kent and Surrey a run for their money. This was a really disappointing result after a run of six consecutive wins and realistically ends any prospect of winning the Region for this year as Surrey had a resounding 30 v 14 win over Hampshire.The B team were missing four from the line up who had triumphed over Surrey in June and, with the A team and C team missing a number of players as well, we had to field something of a makeshift side. London started brightly enough, racing into a 5 v 1 lead, before letting things slip to lose the opening set 5 v 6. Indeed everytime London looked like going on a winning run, either poor play or bad luck gave Sussex the lead again and we lost all four sets 5 v 6! Until we are able to turn up to the South coast games with a full strength squad we are sure to struggle to achieve the results we need. After a month off it was good to get back into the county season again, but sadly we travelled to Chichester a player short. In a team with so many school teachers in it August proves to be a popular month for holidays! We all hoped that it wouldn't prove too costly. Despite giving a frame away in each set we got out off the blocks running by taking the first set 8-3. Sadly we couldn't keep the momentum going and as the temperature in the venue rose to tropical levels the errors crept in to our game more so than Sussex's and we lost the next 3 sets by the same scoreline 4-7 - resulting in a 20-24 defeat. Looking at the positives Corinne Grattan showed the form we all knew she was capable of by claiming her first 4/4 and I'm sure it will be the first of many. Sarah Macmullen also got 4/4, while Sue Studman, Anita Meggs and Bobby Preston all notched up 3/4. London welcome regional leaders Kent to JFK's on September 14th. London County youth, Frank Costello, stunned the Junior Pool Championship in Blackpool by reaching the Final at his first attempt, aged 14! 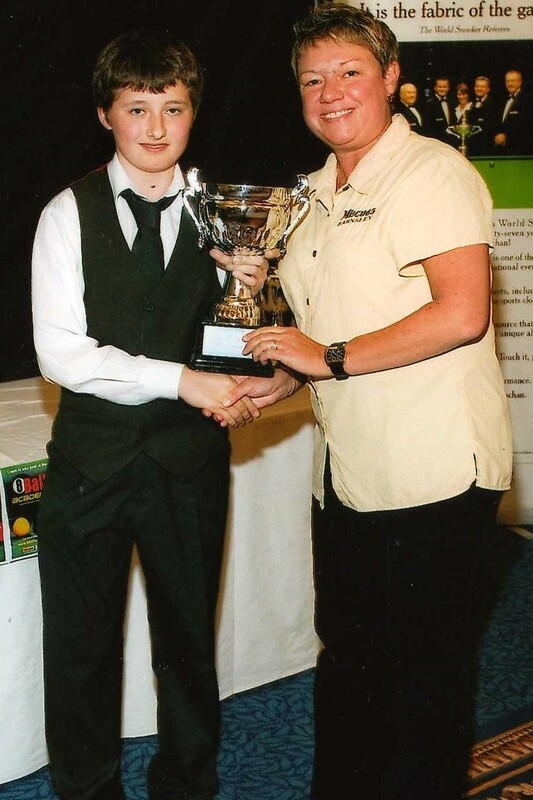 Frank had played very well to win the National Junior Qualifier at Great Yarmouth in May, but few anticipated he would do so well on his first visit to Blackpool. After coming through the early rounds with relative ease, Frank defeated Danny Collinge and Ashley Radford, both England Internationals, with a bit to spare in the Quarters and Semi's respectively, blending tactical know-how beyond his years with first rate potting, to win 7 v 4 in both matches. Unfortunately Frank ran out of steam a little in the Final, against Paul McGuire (England),but make no mistake, this was an excellent effort and surely marks Frank out as a potential future Champion! A sixth consecutive win for London B, and this one was vital as it keeps alive our hopes of winning the Regional title. After sharing the first two sets for an 11 v 11 half-time scoreline, London looked to be in some trouble at 14 v 17, but responded really well with a run of 6 winning frames to take a 20 v 17 lead, before going on to clinch victory. Brijesh Chudasama was man of the match with a smooth 4 out of 4, and he was ably assisted by Jamie Fay, Graham Thompson and Darren Baker, all notching up 3 frames each. This win still leaves London some 10 frames behind Surrey, who are still very much favourites for the Region, but if we can extend this unbeaten run even further then we may give them something to think about towards the end of the season. London Ladies welcomed Surrey Ladies to JFK's on the back of 2 straight wins, however our new found confidence was short lived as Surrey took the opening 4 frames of the match. Perhaps as recently as a few months ago that would have triggered a full scale collapse but we didn't let it phase us and despite losing the first set we clawed back the deficit to just 2 frames as we got to 11-13 behind. Sadly it just wasn't to be and Surrey showed the class they are capable of stretching away from us at 18-12 and despite us picking up a further 6 frames the match went to Surrey 26-18. Winning 3 of their 4 frames on the day were Sue Studman, Carly Newman, Linda Redwood and Sarah Long. Our next match is away to Sussex on August 10th where we hope to get back to winning ways!